International Journal of Research in Health Sciences,2013,1,3,244-247. 1- Associate Professor, Dept of Pathology, Fathima Institute of Medical Sciences, Kadapa., A.P, INDIA. 2- Professor, Dept of Ophthalmology, S.V.Medical College, Tirupati, A.P, INDIA. Eye donation is an act of donating one’s eyes after his/her death. Only corneal blinds can be benefitted through this process not other blinds. It is an act of charity, purely for the benefit of the society and is totally voluntary. An Eye Bank is a charitable organization and is not for profit. The study aims to assess the knowledge of the undergraduate medical students of RIMS Medical College, Kadapa regarding eye donation. In this study, 98.2% of the under graduate students were aware that eyes could be donated after death. 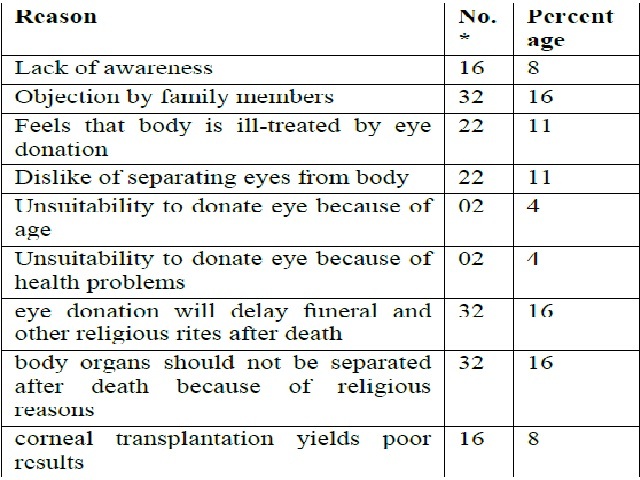 Only 50% knew that any person above 2 years can donate eyes. Only 16% knew that persons who has undergone Lasik cannot donate eyes.